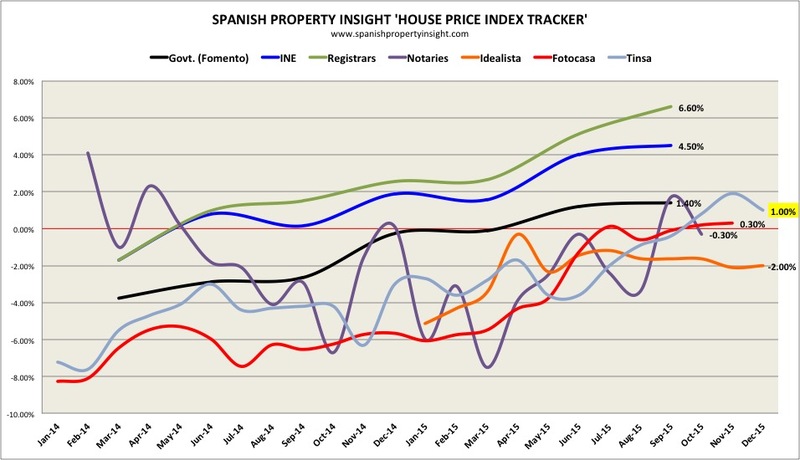 Tinsa Spanish house price index 2015. Regional variations. Spanish house prices rose 1% last year, according to an index published by Tinsa, Spain’s leading appraisal company. As a quarterly index focused on local markets, the headline figure was lifted by increases above 2% in the regions of Catalonia, Madrid, and the Balearics. This is the first time since 2007 this Tinsa index has end the year higher than it started, but we will still have to wait and see what the overall market index is for December, which will be published by Tinsa in a couple of weeks. 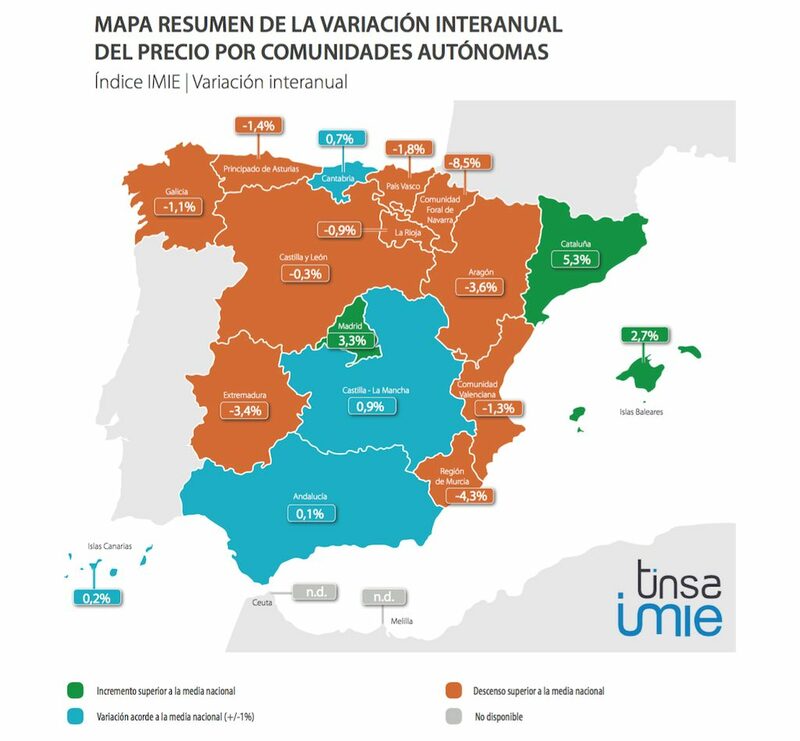 By autonomous region, prices rose the most in Catalonia (+5.3%), followed by Madrid (+3.3%) and the Balearic Islands (+2.7%). They fell the most Navare (-8.5%) and Murcia (-4.3%). See the map above for more house price changes by region. Tinsa Spanish house price index 2015. Provincial variations. By city, prices rose the most in Barcelona (+8.5%), whilst Madrid rose by 3.8%, and Valencia by 0.6%. 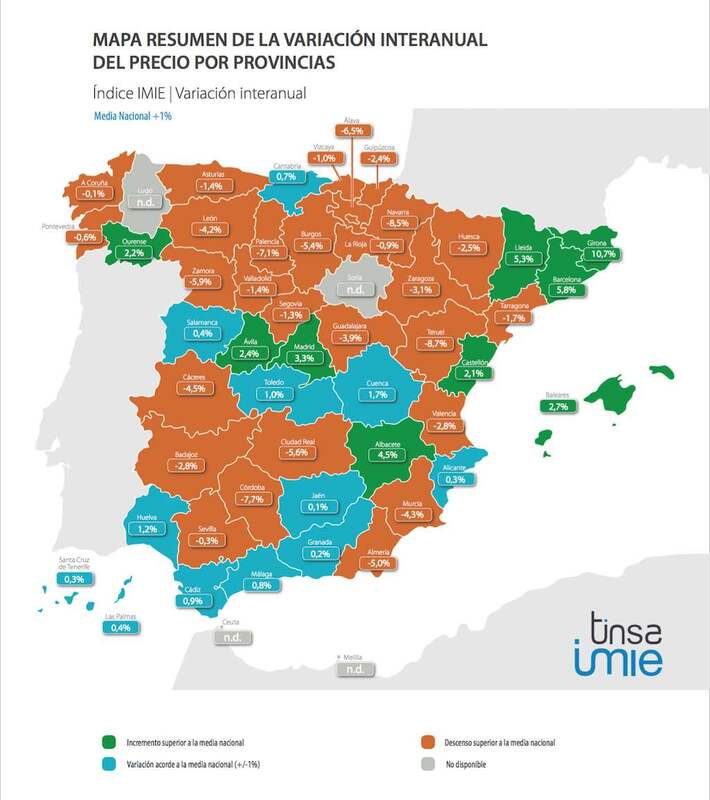 Tinsa Spanish house price index 2015. City variations. Tinsa forecast the market will continue to stabilise and return to normality in the course of 2016, with prices falls moderating in areas where they are still going down, and rising between 1% and 5% in the areas recovering the best. However, they warn of “uncertainties that could end up influencing the expected evolution of the market,” most of all the “current political scene” but also high levels of debt and the poor quality of jobs being created by the economic recovery. In the context of the SPI House Price Index Tracker (HPIT), the latest Tinsa figures provide further evidence of a trend towards stability, with prices rising a faction but showing no signs of taking off. The appraisal company Sociedad de Tasación (ST) has also just released figures showing that new property prices rose 2.9% in the course of last year, the first time that has happened since 2007, up from -2.2% a year ago. New home prices rose 6.2% in Madrid and 4.8% in Catalonia say ST. They also report an increasing rhythm of sales in 2015, especially sales involving buyers from abroad.